Here are the best Star Wars games you can play on PC. When considering the best Star Wars games for this list, it's clear that the saga has had its ups and downs on PC. During the '90s and early '00s, LucasArts had a lot of hits, particularly with games that were targeted at using a mouse and keyboard or a joystick—these were the days when Star Wars games would launch just on PC, instead of every single console, too. And honestly, based on recent experience, it was a better time for fans of games based on Lucas's iconic films. It's hard to envision EA making a new X-Wing with just PC players in mind, for example. While a previous version of this list was in a numbered order, here we've revised that so we can fit in more of our favourites. 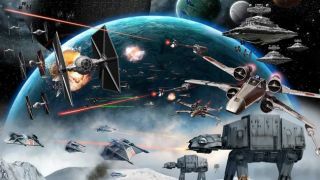 Among this bunch you'll find brilliant dogfighting games, first-person shooters, Jedi duelling and even an RTS. If you're looking for some not-so-good Lucasarts tie-ins, which are still loveable in their own right, check out our list of the worst Star Wars games. This light tactical FPS is one of the most enjoyable games to come out of the Clone Wars/Revenge of the Sith era, which is mostly remembered for disposable PS2 nonsense like Racer Revenge and Bounty Hunter. While Republic Commando looks a bit rough these days, it's refreshing to see that era of Star Wars executed with the right adult (but not too serious) tone. If the prequels were more like this, you might even have enjoyed them. After an extremely effective opening sequence where you watch the creation of your clone captain in first person, you're put in control of a squad of clone specialists. You can order them around with simple presses of the F button, prodding them towards highlighted parts of the environment to blow things up, converge on a single enemy, or take control of an area. With decent dialogue and voice acting, too, it's still easy to recommend now. The neatest touch, which I've heard everyone bring up when discussing this game, is the comical windscreen wipe effect on your helmet that kicks in whenever its gets dirty or damaged. It wasn't the most radical, in-depth or interesting RTS around back in 2006, but it's nonetheless as close as an official Star Wars game has got to capturing the magic of the saga's space and ground battles (better than Force Commander did, anyway). Petroglyph's Empire At War even has multiplayer again these days, after the developer switched it back on in September. If one sci-fi multimedia series isn't enough for you, check out Andy's recent feature where he pitted the ships of Star Wars against those of Star Trek in a brilliantly detailed mod, then try it out yourself. When Rogue Squadron landed on GOG, I played through over half of it in one night. It’s still a brilliant shooter, featuring every Rebel spaceship with their own differences in sound design and feel (except the poor old B-Wing). In the late '90s I was obsessed with Star Wars games—I think I still have a PC Gamer demo disc containing only Star Wars game demos that I played again and again for about two years—and Rogue Squadron is weirdly one of those titles considered an N64 game before a PC game, even though it came to PC first in North America. I only ever played it on PC, and for someone watching the Star Wars Special Edition VHSs every day in 1999, Rogue Squadron blew me away. That’s partly because of the level of fan service employed in setting some levels in familiar locations (or some you heard in passing, like Kessel) or having the Millennium Falcon turn up halfway through a mission, but also because it’s so simple an arcade shooter that it's aged pretty well. Rogue Squadron, I suspect, was created to emulate Nintendo's brilliant Star Fox 64, with planets represented as little hubs and most completable in the space of about ten minutes. It's a really easy game to get to grips with in terms of the way each Rebel craft moves, and it was nice counter-programming to the X-Wing series if you weren't always in the mood for a sim experience. The only thing that drove me insane about Rogue Squadron is that its two best levels—and surely a reason to buy the game for most people—were the Death Star trench run and the Battle of Hoth, both of which were hidden bonuses that had to be arduously unlocked by collecting gold medals. They should've been the first missions in the game! Though Rogue Squadron didn’t have the Battle of Endor (which is okay because X-Wing Alliance did that brilliantly and makes more sense in a sim style), this was a very complete-feeling game for players who particularly love the space and ground battles of Star Wars. It’s got some fun Expanded Universe bits, the Millennium Falcon as an unlockable and even patched in the Naboo Starfighter from Episode I, back when The Phantom Menace was more promising-cool-thing than pop culture atrocity. I regret that that LucasArts didn’t bring its sequel, the stunning GameCube shooter Rogue Leader, to PC (is it too late for this to happen? Capcom is porting its console back catalogue to PC—no reason LucasArts shouldn’t do it), and it’s sad that Factor 5 is no longer around to create more games in the series. It seems like a waste to let the series die when it’s such a good representation of a major part of Star Wars. Also recommended—but not good enough to be on this list because there are no X-Wings in it—is the similarly angled Battle For Naboo, which for my money would’ve been a way better addition to GOG than the weaker Star Wars Starfighter. That was the third best Prequel Trilogy game after Racer and Republic Commando. Hopefully it happens someday. Rogue Squadron fans would lap it up, I’m sure, but for now this remains the best you can get on PC. Knights of the Old Republic's success comes down to a single smart creative decision. By setting their story thousands of years before the events of the films, BioWare neatly removed themselves from the complex and contradictory state of the expanded universe in the early noughties. Given the freedom to do more or less what they wanted, they were able to build a Star Wars RPG that made that galaxy far, far away feel fresh again. This was an era when Star Wars fiction was frequently tripped up by its addiction to iconic characters and set-pieces. The original Knights of the Old Republic demonstrates that repetition can actually be a good thing if it's sufficiently well executed. The plot is, after all, built from familiar parts—easy-going smugglers and their lifebound wookiee companions, deadly battlestations, young Jedi learning about the Force. Knights of the Old Republic works because it drills deeper into these ideas than anyone had for a long time, capturing what made those original moments special in the first place. I'm pretty sure that Revan moment was the most surprised I'd been by a Star Wars story since the first time I saw The Empire Strikes back, even though the two reveals are structurally equivalent to each other. This, incidentally, is the key to understanding the difference between KOTOR and its sequel—the former is an intelligent reconstruction of familiar Star Wars notions, while the latter is an intelligent deconstruction of them. That's perhaps a tangent too far. The point is: this series represents a high point for developers investing serious thought into their Star Wars stories. You should play it for that reason. Star Wars Galaxies should have been one of the most important MMOs ever made. It had the ambition and the credentials for it—one of Ultima Online's lead designers creating a fully-3D persistent world where everything was driven by players. A ground-to-space simulation of the Star Wars universe with player houses, player cities, player ships, player factions. It's the dream that currently powers Star Citizen, and it almost saw the light of day a decade ago. I'm still a little heartbroken that it didn't. SWG sits near the top of the list of my personal games of all time, and I'm still angry about the way it all panned out. This was an extraordinary game for roleplayers. The chance to just live in a totally open, totally customisable simulation of the Star Wars universe was an irresistible one, and when it worked, it worked wonderfully. I feel like Roy Batty at the end of Blade Runner saying this, but man—I've seen things you people wouldn't believe. I've played through Star Wars stories that you'll never get a chance to because they only existed because of the power SWG gave its players. I've taken down a rival bounty hunter in a duel in the streets of Bestine. I've flipped an Imperial gunboat upside-down so that the fleeing spy manning the top-mounted railgun can get a clear shot at the A-Wing on our tail. Star Wars Galaxies was killed by two things: balance problems and its license. The former is something that should have been handled with far more care, and the latter is something that shouldn't have been a problem at all. When the game was conceived, Star Wars was a place—somewhere you could set an MMO. By the time the game matured, Star Wars had become a set of symbols, and the game was ripped apart by the need to cram as many of them into it as possible. Iconic 'theme park' worlds. Collectible movie trinkets. A little button at the start that lets you be a Jedi by clicking a picture of Luke Skywalker. All of this was utterly contrary to the spirit of the game SOE originally set out to make, but it can't take away from how many wonderful experiences I managed to have before it all fell apart. I think I'm still angry about it, guys. Wait, no. I'm definitely still angry about it. Jedi Knight 2's lightsaber mechanics are important not only to the history of Star Wars games, but to multiplayer gaming on the PC in general. This was the game that established a passionate, competitive community dedicated to the concept of the one-on-one melee duel. Jedi Academy expanded and improved many of these ideas, but Jedi Outcast was there first. Without it, gaming would be much poorer—Blade Symphony wouldn’t exist, for one thing. This was the first game to make duels feel like duels—acrobatic contests between two skilled combatants using deadly weapons. Most Star Wars games still get this wrong, treating sabers like regular swords. Jedi Knight 2 made the weapon in your hand feel hot, lethal, precarious. Each contest with Dasaan's dark Jedi was imbued with a sense of danger. A note of praise, too, for the campaign. Early-noughties Raven shooters were a staple of my adolescence, reliably exciting action-adventures with colourful characters and great set-pieces. Jedi Knight 2 is among their best work, particularly the sense of mounting power it encourages. You start off without a lightsaber, crawling through vents and blasting Stormtroopers a la other Dark Forces games. By the end you're a force of nature, culling whole squads at a time as a blur of Force power and hot blue light. Well worth revisiting. Knights of the Old Republic 2 is the quintessential Obsidian Entertainment RPG. The successor to a Bioware game, developed at a frenzied pace in only a year and a half, littered with cut content to hit its release date, and at times (like, a lot of times) utterly crippled with bugs. Even playing KotOR 2 years after its initial release, with a forum-brewed concoction of bug fixes and content-restoration patches, it's quite possibly the buggiest game I've ever completed. And yet it's brilliant, in spite of all those issues. Here's Knights of the Old Republic 2's dirty little secret: it's not very good at being Star Wars. At least, not the classical film Star Wars of unambiguous heroes and villains, where the light side of the Force is always right. Lead designer Chris Avellone took Star Wars to the darkest place it's ever been. The Jedi are imperfect. The Sith are nuanced—manipulative, intimidating, but obviously scarred and broken in human ways that led to their downfall. Your mentor Kreia spends much of the game criticizing the Jedi, and she always speaks about the Force in shades of gray. Knights of the Old Republic 2 is the rare Star Wars game—really the rare video game, in general—that will show bad things happening to characters even when you try to help them. Kreia is the key to KotOR 2's greatness, a character who is clearly haunted, bitter, manipulative, and yet right in so many ways. Avellone and the rest of Obsidian reexamined Lucas's galaxy through the lens of Kreia's ideology, and it's probably the most thoughtful take on Star Wars we'll ever get. Even when bugs stopped me from progressing, when save files refused to load, when the ageing battle system left me frustrated, I had to push on to read just one more line of dialogue. It's simply the best Star Wars story ever written, buried in a game that only works right about half the time. Jedi Academy grants you far more freedom than its predecessors. There's a bit of BioWare to the way you pick between different identities for your character at the start, the way you move through the campaign by choosing missions from a list of options, the way your alignment to the light or dark sides hangs off a mixture of large and small decisions. Starting you with a lightsaber from the get-go, this game is all about mastering a combat system with a remarkably high skill ceiling. There are multiple types of saber, including Darth Maul-style double-sabers, dual sabers, and increased depth for single-saber fighting. It's a little messier than Jedi Outcast as a consequence, but far more stylish. I played this game to competition dozens of times between 2003 and 2005 because it felt so good to carve new paths through each level. I treated it as an opportunity to direct my own Star Wars movie, each run of moves just as important for their aesthetic value as their combat effectiveness. Despite the aging engine it still holds up remarkably well—landing a heavy blow after a wall-run feels amazing even now. I can't believe it's twelve years old, and it's even stranger that the series ended here. No Star Wars game has done lightsabers this well since. It's crazy, when you think about it—fourteen years since the last time a developer rendered the series' most famous weapon in an interesting way. People who were born the month Jedi Academy came out are now almost too old to train as Jedi! If Jedi were real. I understand that they are not. Old Battlefront 2 is a bit of a mess. But what a joyous, silly, damn fun mess of a game it was. Where most Star Wars games cast you as a Jedi or a heroic pilot, Battlefront and Battlefront 2 finally had the good sense to make you just another trooper on the ground, a lowly Stormtrooper or rebel soldier with a good old fashioned blaster at your side. There's something sublime about that: Battlefront is the rare chance to feel like you’re playing inside the Star Wars universe, rather than carving out a new destiny. It plays like a goofier Battlefield, with floaty jump physics and battles that were more chaos than calculated strategy. AI enemies are nothing but stupid cannon fodder, and yet they’re so satisfying to mow down in droves. It’s hard not to love a Star Wars game that unabashedly gives you every toy you could ever want to play with. Sure, jump in an AT-ST! Sure, play as a wookie with a bowcaster! Sure, ride a tauntaun across the surface of Hoth. Oh, you want to be a wampa? Yeah, hell, why not. Battlefront 2 added hero characters to the original game, and sure, they’re crazy unbalanced. But who doesn’t want to Force-sprint across a map as Obi-wan Kenobi and slice up a bunch of droid troopers? How could you say no to landing a fighter inside an Imperial Star Destroyer, fighting your way through its corridors, and destroying it from the inside? Battlefront 2 is the most unabashedly video gamey Star Wars game of them all. Revel in its silliness. In every possible way, TIE Fighter was a space jockey's dream. It took the formula established by X-Wing and polished it to a perfect shine with glorious graphics and audio, an exciting variety of ships, and a multi-layered narrative wrapped in an overload of Star Wars bombast. You even got to fly with Darth Vader himself! But its real genius—the element that transformed it from a great starfighter sim to an unforgettable Star Wars experience—was the way it convincingly turned one of sci-fi's most famously evil empires into a force for good. By portraying the Galactic Empire as a bulwark of peace, order, and good government standing fast against a band of violent, lawless terrorists—and playing it completely straight—it pulled me in: I was blowing Rebel ships into radioactive space dust, and I was the hero. Sure, there was some shadiness going on around the edges, but the greater good was always served. The instructions came in the form of a pseudo-novella entitled The Stele Chronicles that humanized not only the lead character, young Maarek Stele, but also many others, like his friend Pargo, who signs up to be a stormtrooper, and the fatherly admiral who guides him through the early stages of his career as a pilot. The strategy guide took it even further, painting a picture of Imperial life as one of camaraderie, heroism, practical jokes, and, sometimes, emotionally-wrenching losses. I wasn't fighting for the Empire simply because the game forced me down that path—I was doing it because I wanted to. It was the right thing to do. And I loved it. While it wisely didn't try to ape the events of the movies beat by beat, the first LucasArts Star Wars game was still filled with enough familiar sights, sounds, and details to make you feel thoroughly connected to the fiction. It was exciting to do the stuff the characters yelled about in the movies, like diverting power to the shields and weapons, not to mention activating the hyperdrive at the end of every mission. You got to dock (in cutscenes) with familiar ships like the Mon Calamari Star Cruiser, and were able to fly A-Wings and Y-Wings, which never got much screen time in the films (though, honestly, I really only ever wanted to fly an X-Wing). While you couldn't look around with the mouse, there were tons of different cockpit views to toggle, including one where you could look back at your trusty R2 unit. Hang on back there! Between missions you "walked" around (doors would slide open when you moused over them) and got mission briefings from the same weird old guy that prepped the pilots who took on the Death Star. It all went a long way toward making me feel like a real rebel pilot engaged in a campaign against the Empire. At the time, the iMuse (interactive music) system had only been used in adventure games, but it was put to stellar (ha) use in X-Wing. Events such as the arrival of enemies and allies were coupled with dynamic musical cues, giving the soundtrack a real cinematic feel. X-Wing's sequel, TIE Fighter, may ultimately have been the superior game, with a better campaign and more interesting story (and that blessed ‘match target speed’ key) but at the time, X-Wing gave me exactly what I was looking for: a blend of exciting arcade shooting and enough fiddly flight simulator options to cover a keyboard. Episode 1: Racer was the first racing game I ever played that felt fast. I mean truly fast. As in, if you lose focus for too long, your mindset quickly deteriorates into “Oh my god oh my god oh my god, don’t crash, turn faster, oh god what’s happening” before you hit one too many walls, lose an engine, and drift slowly to an explosive stop. The glorious thing about that level of speed is it emulates exactly how I imagine podracing would feel. To me, podracing is on the very short list of good things that came from the Star Wars prequels—along with Darth Maul, Jango Fett, and this moment—so for the game version to get it so right was pure ecstasy. Racer didn’t just stop at the speed—it gave you complete control over your pod. You could overheat your engines to boost, push your nose forward to gain speed midair, tilt your pod sideways to make it through small gaps—or attempt to and crash into the wall anyway as I often did—and sacrifice speed to repair an engine mid race. Basically anything you saw Anakin do in the movie, you could do to your pod during a race, but without having to eventually become a Sith lord. Racer gave you all of the detail of the film without the burden of its storyline, instead placing you in the shoes of a generic racer working your way up the ranks of the podracing circuit. Spare parts, upgrades, and even pit droids were all available to buy for any of the 23 possible pods you could unlock. Racer had an immense and, frankly, surprising amount of customizability and detail for a licensed game, especially one based entirely on a 15 minute scene from the movie. But LucasArts managed to incorporate every single thing from that scene to make podracing feel like podracing. It feels fast, dangerous, and fun as hell. The music matches the intensity of the races, and each new track is like exploring a different piece of the Star Wars universe. Even since Episode 1: Racer’s release in 1999, few racing games have matched the amount of depth and speed it offered. Sure, other games let you unlock new cars to customize, but going around a track doesn’t offer the same adventure as dodging rocks on Tatooine, and cars can’t go nearly as fast. Whenever I think fondly back on Racer, I remember the speed first and foremost. I remember how awesome it was to finally unlock that racer who had beaten me a dozen times, and how dangerous it felt to be racing at all. And I remember how glad I am that they made the prequel trilogy, if for no other reason than this game came out of it. Before I ever played Dark Forces, I remember reading the gorgeously illustrated, captivating Dark Forces: Soldier For the Empire, in which Imperial-turned-hero Kyle Katarn infiltrates the Death Star to steal the battle station's schematics. This was a revelation to ten-year-old me: that a new story could tie into the events of the Star Wars films, with a character who felt vital to this universe. When I found out Katarn was the star of Dark Forces, well, I naturally had to play it. That story is the real legacy of Dark Forces: it spawned the Jedi Knight series and its own cast of characters that weaved in and out of the films and the rest of the (now noncanonical) Expanded Universe. Dark Forces helped prove that there were compelling stories to tell outside the films in Lucas' galaxy far, far away. And it let you shoot a ton of Stormtroopers in 3D, which was way novel in 1995. It sounds weird, but being able to jump, crouch, look up and down, and walk around in multi-level maps was pretty exciting at the time, and it helped Dark Forces feel less like the Doom clone it easily could have been. The main appeal for me, though, was that instead of shooting a bunch of demons and monsters I'd never met before, I got to shoot Star Wars men I'd been familiar with for years. Stormtroopers, Imperial officers, probe droids, Gamorrean guards... we got to have blaster battles with all of them, a dream come true for fans of first-person shooters and Star Wars. We even got to fight Boba Fett, who was waaaaay OP, by the way. He'd dodge around in the air like a hummingbird on cocaine, soaking up damage and flinging an inexhaustible supply of missiles in your face. We weren't ready for that. We were expecting the dumb, lame Boba Fett from the films, the moron who deliberately landed right next to a dude holding a glowing laser sword and attempted to shoot him from six inches away. The Boba Fett who was defeated by a pat on the back. That guy. I love the hell out of this game and its sprawling, often confusing levels and lovely-feeling guns. My dad got stuck in the sewer level with all the dianogas for ten years. In some ways, he never really left it. Okay, sure, Dark Forces, TIE Fighter, blah blah. We know they're great. But the greatest Star Wars game is obviously Star Wars Screen Entertainment, a 1994 "CD-ROM including different A New Hope-thematic options to use as screen savers." The thrilling screensaver options included an infinite opening text scroll (with customizable text!! ), a (likely poorly animated) Death Star trench run, and a bunch of Jawas being annoying. There were also glacially paced space battles. What's not to love? If you want to own the greatest Star Wars interactive media product of all time, you can find a used copy on Amazon for the bargain price of $1.95. It will almost certainly not work on any computer made after the year 2000. Come on, Wes, we all know Yoda Stories is the secret best.